Responding to the current economic and financial crisis, which severely affects global trade, is an unprecedented challenge for policymakers of the Asia-Pacific region. The severity and speed of the downturn was largely unpredicted and has triggered widespread populist pressure on governments to protect national markets and jobs through protectionist measures. However, unlike in the 1997 financial crisis, many ESCAP developing countries are currently in a position of relative economic and financial strength, as compared with the United States and many European countries, and are therefore in a position to provide a countercyclical policy response through public spending. Moreover, the crisis offers an opportunity for the Asia-Pacific region to strengthen itself for the future by boosting its competitiveness. The purpose of this Guide is to sensitize policymakers as to various trade, investment and trade facilitation policy tools which could be used to counter the economic and social impacts of the crisis. A regionally coordinated policy response will benefit most Asia-Pacific economies as they have grown interdependent as a result of regional integration initiatives and the establishment of intraregional supply chains. 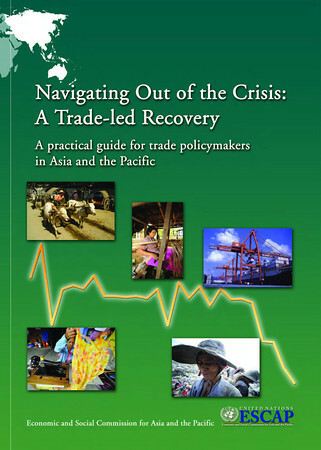 This Guide is structured into seven inter-related topics: (1) national coordination for a trade-led recovery; (2) maintaining the supremacy of the multilateral trading system; (3) addressing trade financing and trade development constraints; (4) diversifying products and markets for exports; (5) enhancing South-South trade and cooperation; (6) promoting Asia-Pacific businesses for long-term competitiveness; and (7) looking beyond the crisis – positioning the Asia-Pacific region for the future.